…and as I haven’t written for a couple of weeks and felt inclined to do so, I thought I’d share the outcome. Beautiful words and truths here. Do you think it makes one lazy to write mostly from prompts? 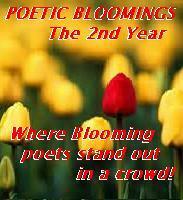 I am in my second poem a day challenge (June with Khara House and now Poetic Bloomings) and find the prompts help me focus. Maybe I’d better get back to improve, at least occasionally. I’m so glad I found your page- will be back often to read! I don’t know – perhaps. When I was young my head was full of ideas and confusion and I just had to get it out. After years of not writing it was a poem-a-day that got me started again and I’ve been writing mainly to prompts ever since. I like it because it sparks my imagination. I don’t often just sit and look and see a poem in the vista. When the Baker’s Dozen were writing daily, over a couple of years solid, we always had one day as a free prompt, i.e. unprompted and that was the hardest poem of the week. I guess that makes the answer yes. What I do now is to make a note of ideas or titles. I always need a title to start me off. I should write more off my own bat but I still enjoy the prompt – I love seeing where it takes me – and everyone else. Failed at July PAD!!! Too tired, too behind, too little time! !